How important is a good serve in tennis? Have you been watching the Australian Open? The 2015 professional tennis schedule got underway in earnest this week, with the globe’s best making their way Down Under to compete for the calendar year’s first Grand Slam. At this stage of the competition, a lot of crystal ball gazing takes place, as tennis fanatics attempt to predict the fortune of players throughout the draw. On face value, one would assume that serving prowess would be an important factor contributing to player success at the 2015 Australian Open – or any tennis tournament for that matter. After all, if your opponent cannot break your serve, they cannot beat you! So just how much does a good serve contribute to tennis success? And, who are the most prolific servers in tennis? We analyzed official ATP men’s data, using Business Intelligence and data visualization, to find out! Aussie Sam Groth (ranked #81) registered tennis’ fastest serve in 2014, clocking in at 163 mph. So does that mean he has the best serve? Not necessarily. There are other factors to consider. According to the ATP (www.atpworldtour.com), it was eighth ranked Milos Raonic (Canada) who tallied the most aces in 2014 (1107). But, while Raonic received the most free points on serve during the 2014 season, 19th ranked John Isner, with the second most aces (989), averaged more aces per match (17). While Raonic had the most aces, it was Isner who was most likely to win games on serve in 2014, converting at 93%. 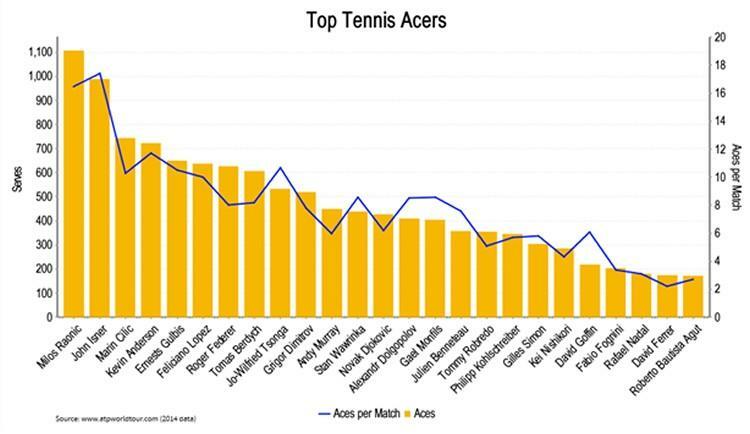 Additionally, Roger Federer also won more service games in 2014 (91%) than Raonic (90%), despite the fact he served far fewer aces (7th overall). 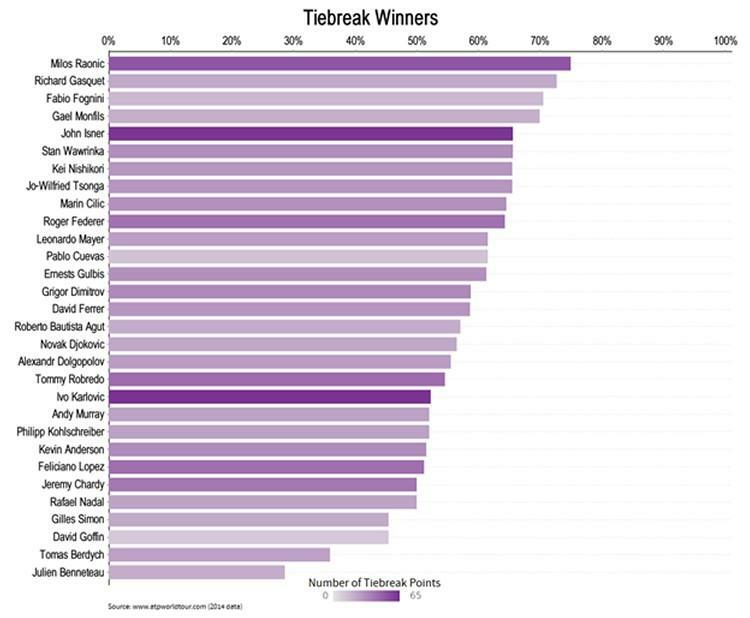 While Raonic dropped to third for percentage of service games won, he did win the highest percentage of tiebreak points (75%) in 2014. Isner, however, ranks 6th with 65% of tiebreak points won. So perhaps Raonic’s serve is actually more potent than Isner’s, because the Canadian giant is more capable of using it to full effect in ‘clutch’ moments? Raonic and Isner both make a strong case for the best serve in tennis. But, ultimately, it’s the outcomes that actually matter, with Raonic finishing the 2014 season with the higher ranking. 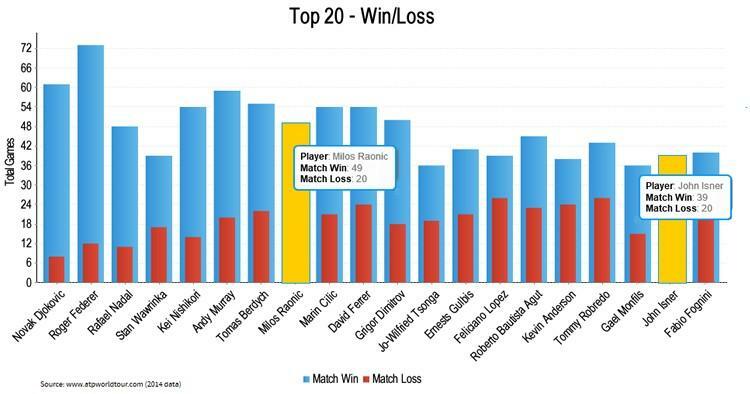 Additionally, Raonic won more matches, and lost fewer matches, than Isner. Crucially, Raonic also had a superior win rate (71%) compared to Inser (66%). So with such powerful service games, why aren’t Isner and Raonic battling it out for the number one ranking? While a great serve helps you win games, winning matches requires other skills too. For example, world No.1 Novak Djokovic (428 aces) finished 2014 with less than half the number of aces of Raonic (1107) and Isner (989). Similarly, Rafael Nadal ended 2014 ranked third in the world, serving only 118 aces. So who do you think has the best serve in tennis? And what other attributes, qualities and traits are required to climb tennis’ pinnacle? We’d love to hear from you.